A veteran NASA astronaut and two rookie cosmonauts are poised to begin their journey into space today (April 4) by launching into orbit aboard a Russian spaceship named Gagarin. Ron Garan, a native of Yonkers, N.Y., will be making his second trip to space after riding the space shuttle Discovery on the STS-124 mission in 2008. He will join the station crew as an Expedition 27 and Expedition 28 flight engineer. Garan's mission is expected to overlap with the final flight of the space shuttle Endeavour, which is set to launch on the STS-134 mission April 19. After that, NASA has only one more shuttle mission planned before the three-orbiter fleet is retired. "It's going to be a sad day when it's retired," Garan, 49, told SPACE.com. "I think it's going to be many generations before we have the capability that the space shuttle provides us right now. It's an amazing vehicle." Garan is a retired colonel in the U.S. Air Force. He was selected as an astronaut in July 2000. Garan has dreamed about becoming an astronaut since watching the first moon landing on a black and white TV at a family party when he was a child, he said. He's still amazed at his luck in landing the job. "The gee whiz factor, it's never worn off," he said. He and his wife Carmel have three sons: two 20-year-old twins and a 16-year-old. "For them this is really all they’ve ever known, to them this is just what I do for a living," Garan said. Andrey Borisenko, who was selected as a cosmonaut in May 2003, will be making his first trip to space when the Gagarin lifts off today. 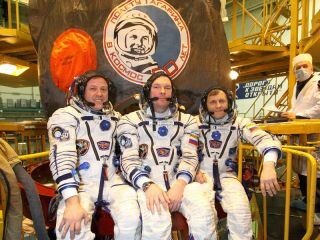 "I greatly look forward to the flight itself," Borisenko, 35, told SPACE.com. "I think every minute of our flight will bring something new and something amazing. From what I have heard from other crewmembers, it is quite possible that the six-month increment will fly by as one minute." He is due to serve as an Expedition 27 flight engineer, and then transition to the role of commander of Expedition 28 in May. Borisenko and his wife Zoya have a son, Ivan. The proud father said it is unlikely his son would ever choose to become a cosmonaut, but he'd be pleased if he did. "My stories of spaceflight have not been very exciting for him and I'm worried that he watches too much television and is not interested in what we are doing in space," he said. "He has seen Star Wars by George Lucas so the actual cosmonaut life does not seem very exciting to him." The third member of the Soyuz Gagarin flight, Alexander Samokutyaev, will also be making his rookie trip to orbit and will command the Soyuz trip to the International Space Station. Samokutyaev, 41, said it was a special honor to be flying aboard Gagarin, because he was particularly inspired by Gagarin's groundbreaking Vostok 1 mission as a child. "I was born 10 years after flight of Yuri Gagarin," Samokutyaev said. "All I know is based on what I heard. Quite often thousands of people would gather on the streets to listen to the radio. Everyone back then wanted to become cosmonauts." He and the other space station crewmembers will spend most of their time running the station and conducting scientific research. "Personally for me, I'm most interested in Earth monitoring experiments where you monitor Earth's surface and try to predict natural disasters," Samokutyaev said. Samokutyaev, a lieutenant-colonel in the Russian Air Force,was selected as a cosmonaut candidate in 2003. He and his wife Oksana have a 16-year-old daughter, Anastasia. He said his family's experience throughout his busy training schedule for the mission would help them get through the long months with only the phone and e-mail to communicate. "My wife and daughter were always with me wherever I would go," Samokutyaev said. "They have been supporting me here throughout my training in Houston. At this point I think they're so much used to all of this." You can follow SPACE.com senior writer Clara Moskowitz on Twitter @ClaraMoskowitz. For updates on the Soyuz launch and arrival at the International Space Station, follow SPACE.com on Twitter @Spacedotcom and on Facebook.